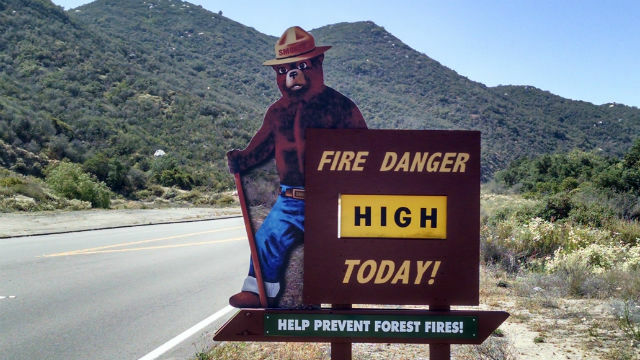 A fire danger warning in Southern California. Photo by Chris Jennewein. The National Weather Service has issued a fire weather watch from Monday afternoon through late Wednesday, due to strong gusty winds and low humidity. This advisory is in effect for areas in California, including portions of the mountains and desert foothills in San Diego County, announced the NWS. Increasing wind combined with a sudden, intense drop in humidity, may create critical periods of hazardous wildfire conditions, said the NWS. A high pressure system will retreat offshore and contribute to a low pressure trough spreading across the state. This trough will cause an unusual burst of strong onshore flow for the first time this year, according to the NWS. The onshore flow will go along the mountain ridges and into the desert slopes.